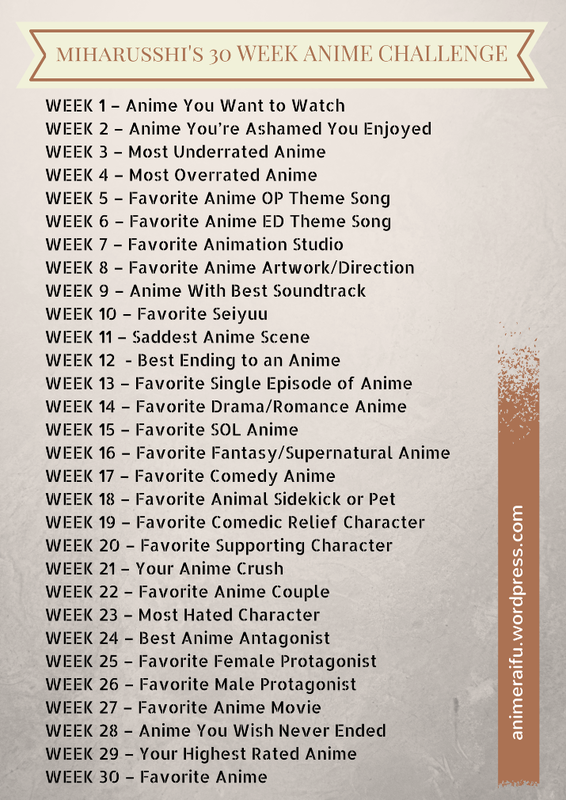 I’ve already written an introductory post to my take on the originally 30-Day Anime Challenge (meme). Note that the challenge I’ve taken is quite different from the standard one that other anibloggers like arriacross, nikki, and mochirochi are taking. This page will serve as an index of my posts and, although I’d initially planned on posting every Friday/Saturday, updates might not be on-schedule. Alternatively, you can find all my posts here. This is not in any way intended to be a comprehensive list of all the anime bloggers who participated in this challenge. It simply serves as my personal directory of anibloggers who I met through this challenge, as this challenge began spreading again when ArriaCross started doing it for fun. Check their answers out! Don’t hold back if you’re interested to do this, too (Click on this link from fujinsei you’d like to follow the apparently ‘standard’ 30DAC meme)! Mii-chan of Otaku lvl up! No problem, and thanks for the kind words!